Members in the original Old Farts Car Club from the state of South Carolina. 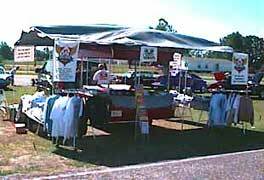 Here is the illustrious Old Farts Car Club vendor tent on the site of the South Carolina rod run and drag race sometime back in time. Darlington, South Carolina just down the road from the Darlington Raceway.